The camera has a breech lens mount not used from any other single-lens reflex camera. This type of mount, with a 50mm distance of the camera flange to film plane, allows the use of lenses of others 35mm cameras, via an adapter, for close-up only. • Manual and preset lenses were produced by Carl Zeiss, Meyer-Optik, Angenieux, Enna, Feinmess, Isco, Kilfitt, Schacht, Schneider and Steinheil. • Semi-automatic lenses were produced by Carl Zeiss, Steinheil and Schacht. • Automatic lenses were produced by Carl Zeiss, Isco and Schacht. • Manual and preset lenses were produced from Carl Zeiss, Meyer-Optik, Kilfitt, Schneider, Astro, Novoflex, Piesker, Tewe, and Max Weth Optik. • Preset lenses were manufactured by Japanese companies with "T" mount systems. • The automatic Sonnar 180mm and Sonnar 300mm, supplied by Carl Zeiss Jena with Pentacon Six mount, fit Praktina IIA by means of an auto adapter. The control of the diaphragm is one of the main features in the lens specification. It's important to understand the differences of the diaphragm mechanisms to use correctly the Praktina lenses. Each listed lens has a code that indicates the different diaphragm's feature. These lenses have a ring to manually close down the diaphragm to the wished aperture. The diaphragm will remain close until it is reopened manually. These lenses fit and work on all models. These lenses have a ring to manually close down the diaphragm to the wished aperture with a click stop at full and/or half steps. The diaphragm will remain close until it is reopened manually. These lenses fit and work on all models. These lenses have a ring to set the diaphragm aperture to a preset value. Before taking the picture turn the preset ring until it stops, this will close down the diaphragm to the preset aperture. The diaphragm will remain close until it is reopened manually. These lenses fit and work on all models. These lenses have a ring to set the diaphragm aperture to a preset value. The cocking ring opens the diaphragm manually to the largest aperture and set a spring mechanism. Before taking the picture press the push bottom on the lens barrel and the diaphragm will close down to the selected aperture automatically. The diaphragm will remain close until it is reopened manually. These lenses fit and work on all models. These lenses have a ring to set the diaphragm aperture to a preset value and a pin that engage with the internal mechanism of the camera. A cocking lever opens the diaphragm manually to the largest aperture and set a spring mechanism. The internal actuating pin moves forward when the shutter release is pressed, and the diaphragm will automatically close to the pre-selected aperture. The diaphragm will remain close until it is reopened manually. These lenses work properly on the Praktina FX models DS, SA1, SA2, SA3 and Praktina IIA model DA even if they fit on all models. These lenses have a ring to set the diaphragm aperture to a preset value and a pin that engage with the internal mechanism of the camera. 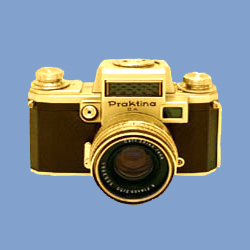 The internal actuating pin of the Praktina IIA model SA moves backward when the shutter release is pressed, and the diaphragm will automatically close to the pre-selected aperture. The diaphragm opens automatically when the shutter is cooked. These lenses work on the Praktina IIA models A and DA even if they fit on all models.